Yesterday I attended a luncheon at CinemaCon in Las Vegas hosted by FilmDistrict, the newly created distribution company lead by Peter Schlessel and created by producer Graham King of GK Films. The company has a strong slate of films for 2011, including Insidious this weekend, but they also have two films I'm very excited to see later this year: Nicolas Winding Refn's action film Drive, and James Mather & Stephen St. Leger's sci-fi film Lock-Out (aka Lockout). A few photos were on display and I asked to put them online, but was told no. However, SlashFilm and Collider posted the photos anyway - so here they are! 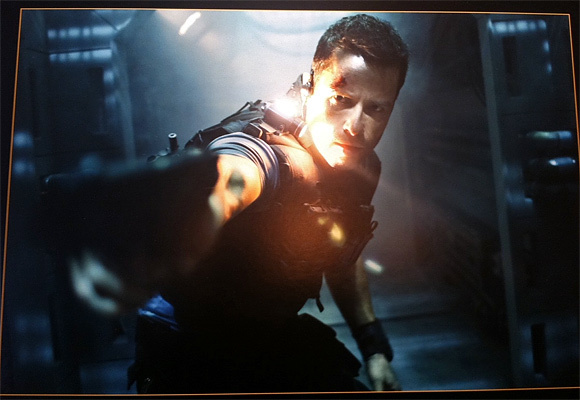 Here are the two shots from Lock-Out, featuring Guy Pearce and Maggie Grace, out February 24th, 2012. 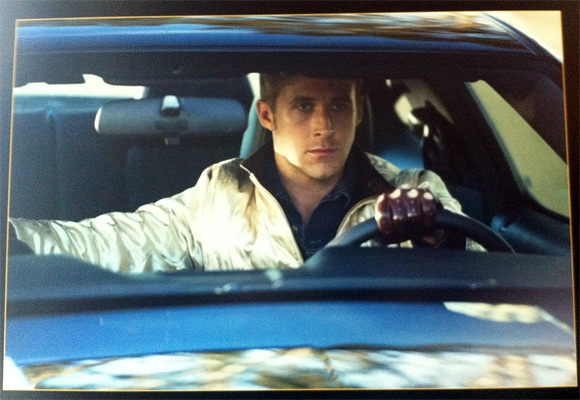 Here are the two shots from Drive, featuring Ryan Gosling and Carey Mulligan, out on September 16th. Drive, being directed by Nicolas Winding Refn (Pusher, Bronson, Valhalla Rising), is about a Hollywood stunt performer (Gosling) who moonlights as a wheelman for criminals discovers that a contract has been put on him after a heist gone wrong. Mulligan is obviously playing the love interest in this and damn I can't wait to see it, because I love both actors and this sounds like it's going to be pretty awesome. Lockout, directed by cinematographers James Mather & Stephen St. Leger (Prey Alone), is a sci-fi about a man (Pearce) wrongly convicted of conspiracy to commit espionage against the US. He's offered his freedom if he can rescue the president's daughter from an outer space prison taken over by violent inmates. Thoughts? I think this film is poor quality. check or streaming this movie on: http://expert-life.com I hope the cinemator will make more quality movie next year. seen memento for the 1st time yesterday, automatically guy pearce is in the legend books! Excellent movie, one of Pearce's best performances. And if you're looking for more Guy Pearce, I might suggest the quirky horror film Ravenous (one of my favorites), the psuedo-western The Proposition, or L.A. Confidential, if you haven't seen them already. will check them out, thanks.. wonder why nolan stopped using him? Maybe Pearce isn't the type to repeat working with the same people over and over. The Coen Brothers do that a lot, especially because one of them is married to Frances McDormand, and it always seems to work, but maybe Pearce is just more explorative than that. It's great, it also stars Robert Carlyle, Jeffrey Jones, and David Arquette, and it's pretty humorous. It's based around a group of soldiers who encounter a survivor of a harsh and prolonged incident in the Sierra Nevadas, who we assume is a member of the Donner Party, so you can imagine where the horror aspect comes from. Don't forget about his excellent performance in Animal Kingdom either! Most underrated actor in our generation. Yeah, there was too little of him in that. Everyone did their part pretty well in that flick, though. And yes, he is completely underrated. THIS NEWS MAKES ME EXCITED!!!! Pearce chooses his roles o so wisely, anything hes in is destined to be good. Does that also apply to "Bedtime Stories"? Although I did love his musical number in it. If SlashFilm and Collider jumped off a bridge would you follow them there too? Just kidding. Thanks for posting the pictures, Alex. At least it's something from the show that the rest of us fans get to see. I'm excited for both films. Just glad these are two original movies with great actors in them!Finally something to be excited about!